First of all, don’t forget to “Like” us on Facebook. You could win a full box of cigars and other neat contests we have coming up! I have been dying to get the chance to smoke this cigar, and thanks again to the wonderful group over at smokingstogie.com, this time in particular Steve Valle, I finally have a chance to take on Drew Estate’s Liga Privada MF-13. 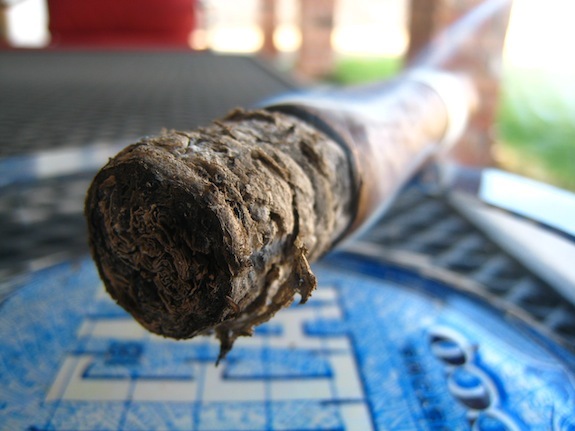 If you haven’t checked out smokingstogie’s site before, then I suggest you do so, NOW. Steve, Brooks, and now Patrick work hard over there bringing you some of the best reviews and photography of some of the most expensive, rare, and exclusive cigars the internet has ever seen. Alright, now onto the review! The Good Stuff: The Liga Privada MF-13 is a new, pre-release cigar that may, or may not ever see full Liga Privada production. Drew Estate is still in discussion as to if they will release the blend to the public or not. 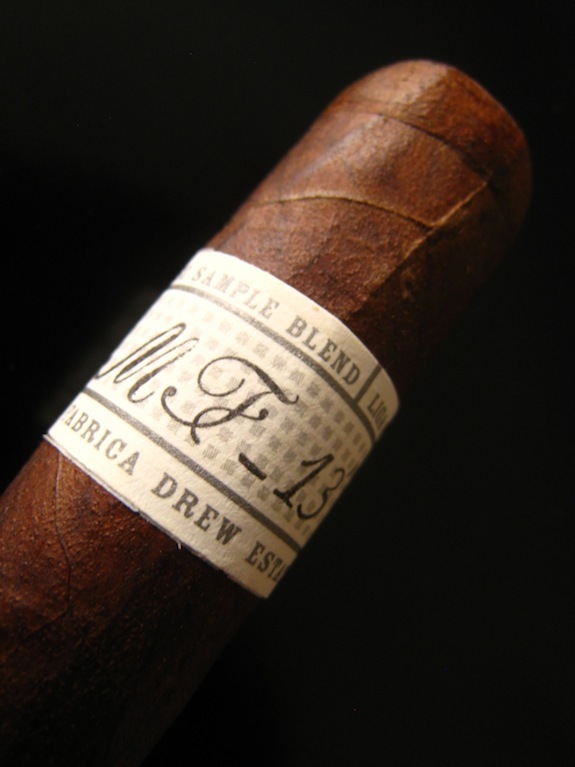 As for now, the MF-13 is only seen when it is shared with Drew Estate’s friends, or at Drew Estate events. The MF-13 pre-release I have is in fact the final blend, not just a sample. 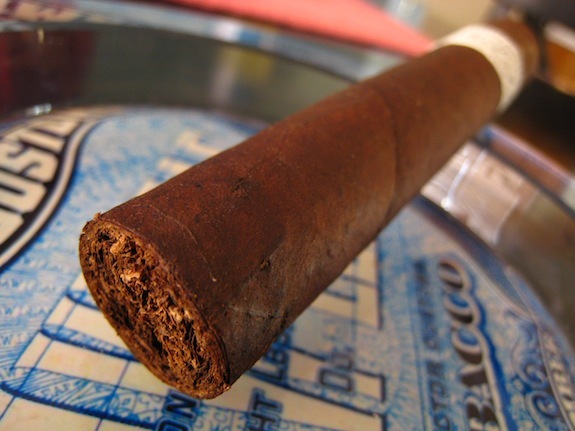 As with all Liga Privada samples shared, Drew Estate will not alter the blend should they decide to release it. 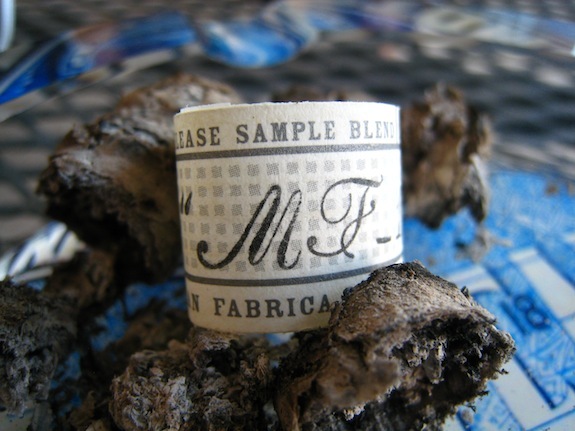 The MF-13 is a reblending using the Liga Privada T52 as a starting point. The blend has been tweaked numerous times, the initial blend being the MF-4, and now all the way up to the MF-13. One thing to note is, Steve Saka actually told me that if they were to release the MF-13 it would not be added to the T52 line, but would be a new feature in the Unicos series. The main difference between the T52 and the MF-13 is the filler recipe of the MF-13 is more Esteli Valley-centric, which makes it a much spicier, bolder smoke. The “MF” in MF-13 stands for what you think it does, but not due to the strength but rather the first thing Steve Saka said when he sampled the blend; “This is Mother F’ing Good”. Gotta love those guys. 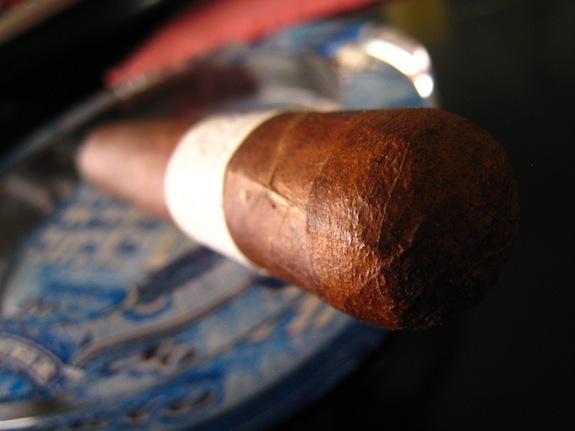 Size: 5 x 52 Parejo – Wrapper: CT Grown Stalk Cut Habano – Type 52 Seed – Binder: Brazilian Mata Fina – Sungrown – Plantation Harvest – Filler: 5 fillers, all Nicaraguan. Prelight: The Liga Privada MF-13 starts out with a very nice, orangish dark brown wrapper with a whole ton of different darker and lighter spots. This cigar is said to contain the same wrapper as the T-52, but it seems so much darker than any of the ones I have on had. I know there is color differences in all leaf and cigars are boxed by closest color, but it’s almost as dark as the No. 9! Anyways, the wrapper is very tough, very firm, and very toothy. This thing feels like a rock giving almost not resistance as I squeeze it. The construction is perfect with only mild veins running through the length of the body up to the round, double cap. 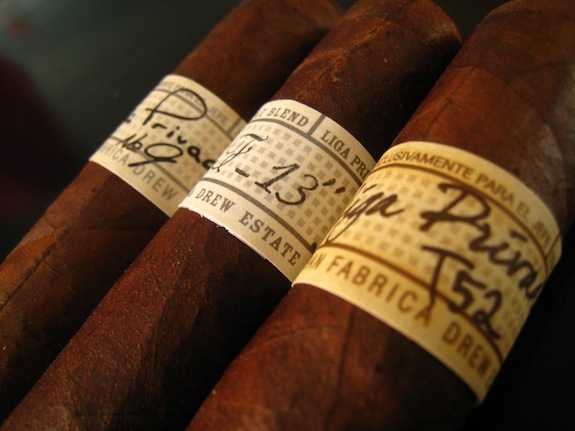 The band is identical in design to the Liga Privada No.9, only it has different text. This one actually says “Pre-Release Sample Blend – Liga Privada”. And of course, the “MF-13” markings. I really like that Drew Estate takes the time to put finishing touches on the band of even their pre-release blends now. Not just ink and paper thrown through a inkjet-printer. The wrapper gives off a very bold, woodsy aroma. Really deep with slight hints of cherry. The foot is a bit more interesting. There is just a ton of spice coming out of there with nice little notes of chocolate, and wood. This cigar smells like a lumber yard. The cap was very easy to cut, and clipped clean using my double bladed Palio cutter. The cold draw is nice and loose giving off this really robust, strong tobacco and wood flavor with little hints of berry. First Smoke: Holy Crap! The MF-13 starts off with this just ridiculous amount of pepper. Wow! After a few initial draws the pepper lets up just enough to pull out some really interesting, very strong grassy, earthy, woodsy flavors with even a tiny note of lime, and what I could only imagine weed would taste like. Of course I haven’t even tried the stuff, but the scent of it reminds me of a very small note I picked up in the beginning of this smoke. All I can say is be ready for this one. It starts off with a bang and quickly separates itself from the T-52. As I mention Saka said it was a “tweaked” version of the T-52 blend which only goes to show how much of a delicate process each blend actually is. The draw is perfect, kicking out massive clouds of thick white smoke with every puff. The stationary smoke on this cigar, as well as any other Liga Privada blend is insane. Tons of lightly scented cedar smoke spills from the cigar while it rests in my ashtray. The burnline started slightly wavy but quickly corrected itself during the first third and is now burning dead even leaving behind a nicely compacted trail of medium grey ash which held on for a little over an inch before giving way. Halfway There: Now into the second third of this Liga Privada MF-13 and it is still the flavor bomb it started out to be. The pepper is still present, but no where near as strong as it once was. The flavor profile now consists of really deep oaky wood flavors with still a tons of earth tones, spice, and just a little bit of the black cherry I picked up in the cold draw. This cigar is strong, and I am feeling it already, but at the same time it’s smooth and really easy to smoke. Very well balanced. The retrohale is still packed with spice and I don’t find myself doing it too often at all. It’s a bit much for me with this cigar. Finish: Into the final third of the Liga Privada MF-13 and the body is still steadily increasing in strength without losing any flavor. The final flavors in this cigar are still a very robust woodsy flavor, a bit of leather sneaked in, still holding on to the pepper and some spice, and a tiny bit of the cherry. Being that this is such a strong cigar, it is relatively easy to smoke developing no harshness at all, even into the final inch. This cigar was very hard to put down, it smoked really slow but even then only took me slightly over an hour to finish. Overview: Before getting a chance to try the Liga Privada MF-13 for myself, Steve Valle and I had a quick conversation on how he actually liked this cigar better then the No.9. As you can imagine, this shocked the hell out of me, and going into this cigar I was a bit biased and compared it greatly to the No.9. Was it better in my opinion? No. But was I disappointed? Not in the least. Despite being based from the T52 blend the MF-13 is (if released) part of the Unicos blend for a reason. It isn’t anything like the T52 or the number 9, it stands alone. It’s kind of funny, Steve was talking to Jonathan Drew and I on twitter and actually made mention of the MF-13 being like the No.9, the T52, and the Dirty Rat all rolled into one. He nailed it. Imagine that concoction of a cigar and you have a MF-13. The cigar is VERY strong, and that alone puts it in another category. The craziest part about it was just how smooth, and relaxing the experience was for such a strong cigar. 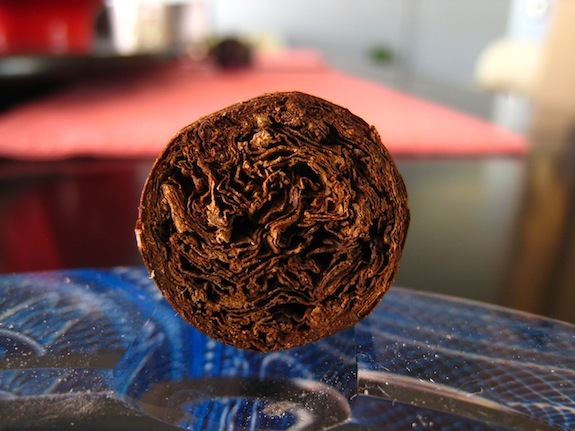 It takes a lot to get that sort of balance, and for me, that says a lot about the cigar. The MF-13 was strong yet smooth, very complex, and just an all around damn good cigar.. For SURE it’s not a cigar I would recommend for the casual or novice smoker. But if you are a seasoned cigar smoker, or a Liga Privada lover, then you may want to pick up quite a few of these, they are well worth it. I’m not certain on the price tag, but I would guess for the robusto it would be in similar Liga Privada range, $10 – $12, albeit a bit expensive for most, I think it’s a completely legit price point and would gladly pay it towards a box purchase. Pairing: Knowing that this was a strong cigar going in, I decided to pair it with a very strong beer. The Asylum Quadruple Ale from Left Coast Brewing Company in California. 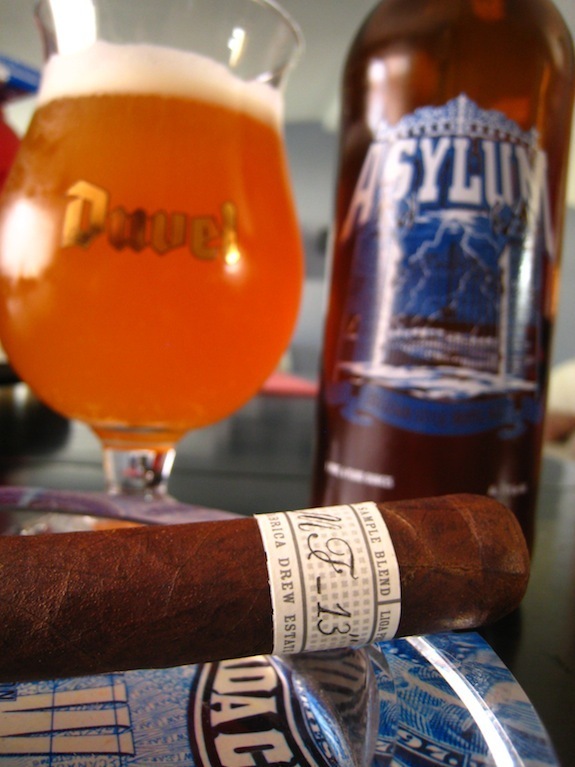 Asylum is a spicy, fruity, tart strong Quadruple ale. Boasting an 11% abv, this isn’t a beer for the faint of heart. The beer paired nicely with the cedar notes from the cigar, but I found it overpowering at times, and even a bit sour. Needless to say I took my time with it as to not hinder the taste of the cigar. I think I actually only drank about a third of the bottle before finishing the cigar, then gulping down the rest. Ideally, with the deep flavors from the MF-13 one would want to pair it with a nice light stout, a porter, or a brown ale. But I’m stupid and like I often do chose power over flavor. It wasn’t the worst pairing, just wasn’t too great. If I had to pair the MF-13 with anything else I think it would go perfect with a nice glass of port, some Dr. Pepper, or some black coffee. I literally am drooling…. I am a T52 guy and just recently had my first rat…. I will need to find these A.S.A.P. One of my locals is pretty good about getting the newer stuff in. I like the 9, but I will always reach for aT52 first… I continue to be impressed with DE and their impressive Liga line…. The No9 is my go to cigar! Hopefully these hit the market Tadd. Drew Estate hasn’t officially released them yet. But when and if they do, keep your eyes out. There is a lot of hype behind them and they’ll go fast! 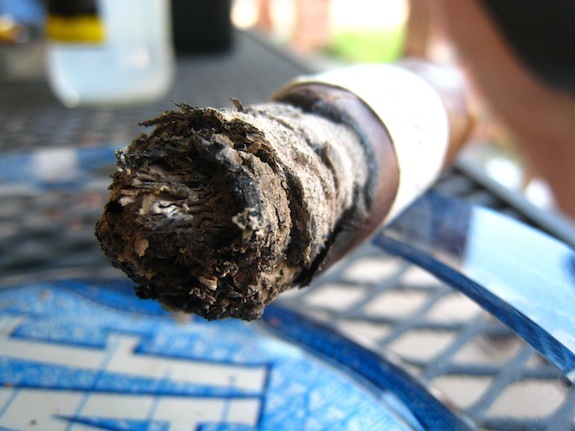 The thing with all the Liga lines is that they are so well balanced and smooth that the strength sneaks up on you. When I smoke one I try to go in prepared with a big meal and a proper pairing otherwise I’ll get some serious Nic-kick, lol. Sounds like they keep pumping out winners in the Liga series and this is another testament to that. I’m in the same boat as Dala, those Liga all creep up on me really fast. Very anxious to try one of these, great review! @Dan – yes, yes they do! But that’s what I love about them! Thanks for the read! ps: Tony is correct – we would not change the blend. Please, please, please release this cigar. I had one in Houston at the serious cigar event, and it was a phenomenal little smoke. 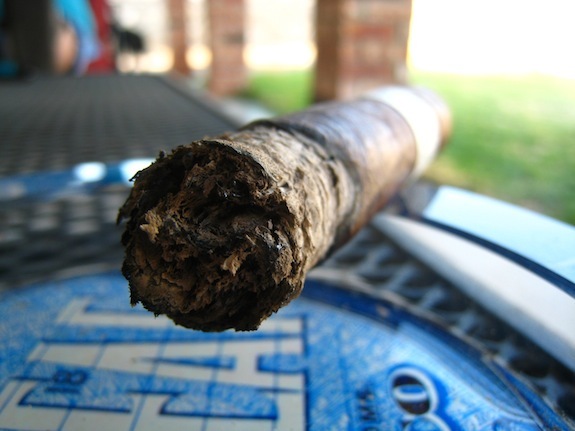 I love the T52’s, but this one was well beyond that stick. Thanks again to the drew estates folks for letting me sample this stick. You’re a pisser ! “what I could only imagine weed would taste like. Of course I haven’t even tried the stuff,” You and Bill Clinton. I really enjoy some of your posts – keep it coming. Stay away from those mosquitos!